Just got your hands on the Nexus 7 and can’t wait to upload or transfer all of your media files onto it? Do you know your device thoroughly in terms of the supported file formats for playback? If not, simply follow us through before you spend hours transferring all of your media files just to be return with an error message of an invalid or incompatible file format. It should be a straightforward process. However, it can get pretty frustrating when it’s not working out as how we think it should be. If some of your media files are not within the supported list, you will need to convert them before importing it to your Nexus 7. 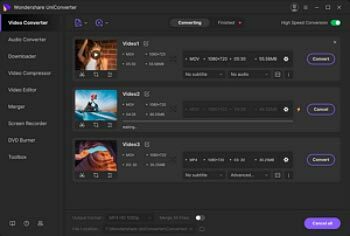 If you have a video converter lying about somewhere, you can simply key in the settings as mentioned so that you’ll get the best quality out of your videos. If you don’t, check out how you can convert your files both online or through a desktop converter. Instead of going through the hassle of having to input each of the video settings, you can directly select your choice of device from the Wondershare UniConverter (originally Wondershare Video Converter Ultimate). After launching the program, you can either Add Files from browsing your local folders, a quick drag-and-drop or even load your DVDs. Isn’t that handy? There’ll be no limitation of downloading videos from your favorite online streaming sites. What are you waiting for? After loading your files, you can select the format Nexus 7 from the Output Format panel > Device > Others > Nexus 7. For additional information on the video and audio codec, you’ll have to click on Edit icon beside each your device model to enter the Setting winodw or click Create Custom to build a new format. Your best video settings for the Nexus 7 can be optimized on the Setting window.